For brine: In a 10-quart stock pot combine 1/2 gallon cider, the water, salt, brown sugar, two onions, garlic, ginger and peppercorns. Using a peeler, remove wide strips of orange zest and add to pot. Reserve the orange. Bring mixture to a simmer over medium-high heat, stirring occasionally. Remove from heat and add ice. Remove neck, gizzards, and liver from turkey body cavity; discard or reserve for another use. Rinse inside and outside of turkey. Add turkey to brine. Place a pie plate on turkey to keep it submerged. Cover and refrigerate 8 to 12 hours. Remove turkey from brine; discard brine. Drain turkey and pat dry. Cut reserved orange into wedges and place in cavity. Tuck neck skin under back. Tuck drumsticks under band of skin at tail or provided wire or nylon clamp. If these are not available tie drumsticks together with 100-percent-cotton kitchen string. Twist wings under back. Arrange remaining two sliced onions and thyme in a large roasting pan. Place a rack in pan. Arrange turkey on rack, breast side up. Add 1 cup chicken broth to pan. Roast turkey, uncovered, in a 325 degrees oven for 2 3/4 to 3 hours or until turkey reaches 175 degrees F when tested with an instant-read thermometer in the center of one of the inside thigh muscles. If necessary, to prevent overbrowning, tent turkey with foil the last 1 hour of roasting. Meanwhile, combine 1/2 cup cider, Calvados, vinegar, butter and sage in a small saucepan. Warm over low heat until butter is melted; keep warm. After the turkey has roasted 1 1/2 hours, begin brushing it occasionally with some of the butter mixture. After the turkey has been roasting 2 hours, add apples to pan, bottoms down. 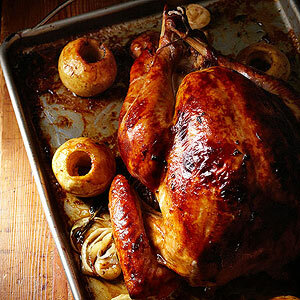 Roast for 45 to 60 minutes or until apples are just tender. Spoon butter mixture over apples and turkey 2 to 3 more times or until mixture is all used. Continue basting apples and turkey with pan juices. If apples are done before turkey, transfer to a serving dish and tent with foil to keep warm. Transfer turkey to the serving platter with the apples and tent loosely with foil. While turkey rests, pour drippings into a heatproof 4-cup glass measure, leaving onions and other solids in pan. Skim fat from drippings. Return 4 tablespoons of fat to pan and discard remaining. If needed, add additional chicken broth to measure to equal 3 cups drippings. Place roasting pan over 2 burners set at medium-high heat. Add flour; cook and stir for 2 minutes. Add 3 cups drippings to pan. Cook and stir with a wire whisk until mixture comes to a boil. Cook and stir for 2 to 3 minutes or until desired thickness. Strain into a serving bowl. Arrange apples around turkey and serve with gravy. * Look for the apples that are packaged in plastic bags in the produce section, as they are typically smaller in size than those in bulk.